Last month, thousands of staffers walked out of Google offices around the world calling for a more inclusive company culture built around “equity, dignity, and respect.” Among the walkout organizers’ five demands was for the company to end forced arbitration for both harassment and discrimination claims. The company only eliminated the former. “The tepid policy change shows that leadership still does not understand how closely discrimination correlates to harassment,” Tanuja Gupta, a Google employee and one of the walkout organizers, told Gizmodo in an email. “Google chose to continue to preserve the present day structural imbalances of power that let harassment and discrimination flourish in all its forms,” Gupta added (emphasis hers). Forced arbitration is a practice tech companies have widely enforced, at least in part to maintain their public image. It means an employee waives their right to a trial by jury and is instead forced to settle any dispute behind closed doors by a neutral third party. 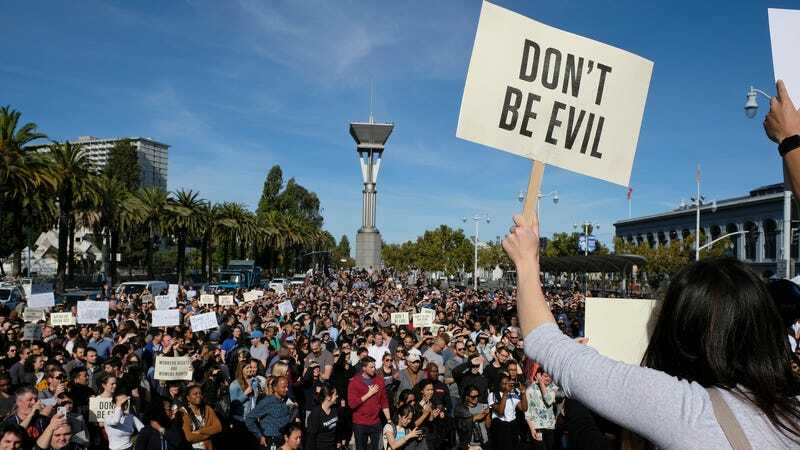 But it wasn’t until the Google walkout—what is likely the largest collective demonstration of tech workers to date—that the company made changes to its arbitration agreements. And, in classic Silicon Valley fashion, other companies began acting with urgency in the shadow of their competition. But Google was not the first—it was merely the biggest and loudest. In fact, it was Microsoft that started the trend, publicly stating last December that it was eliminating these agreements for sexual harassment claims. Uber announced the same changes six months later. And a day after Google announced its changes to mandatory arbitration for sexual misconduct cases, Facebook did the same, followed shortly by eBay and Airbnb. Of these companies, however, only Airbnb and Microsoft said they’ve eliminated forced arbitration for discrimination cases as well as those involving sexual misconduct. The tech industry’s Me Too movement over the last few years has thrust into the spotlight all the ways in which executives have ignored, mishandled, or even contributed to systemic sexual misconduct issues within their walls. By eliminating forced arbitration for sexual harassment claims, employees experiencing these issues now have the ability to have their voice publicly heard. But the industry is also rife with discrimination issues—it’s why companies have, for years, publicly exalted their diversity and inclusion issues, often pointing to the money they’ve thrown at the problem. Their diversity reports indicate that when it comes to gender, they’ve made some meaningful steps, but when it comes to race, the needle’s barely budged. By only eliminating arbitration for sexual harassment claims—particularly when they do so after a PR crisis—companies are signaling that other forms of unjust treatment aren’t as important as others to improve policies around, say employee rights experts. It also creates a more complicated litigation system for those with multiple claims—which, oftentimes, include the most marginalized groups in a workforce. Ellen Pao, CEO of Project Include, a nonprofit working toward providing tech companies with diversity and inclusion solutions, told Gizmodo that getting rid of mandatory arbitration for discrimination claims is not only necessary, it’s a “small second step.” In 2015, Pao accused venture-capital firm Kleiner Perkins Caufield & Byers of gender discrimination. It was viewed as a watershed moment for calling out sexism in Silicon Valley. We asked 15 leading tech companies whether they required their workers to agree to forced arbitration for discrimination claims and, if so, if they planned to eliminate them. Those companies were Apple, Google, Twitter, Facebook, Amazon, Tesla, SpaceX, Verizon, Uber, Lyft, Airbnb, eBay, Reddit, Microsoft, and Slack. Only five companies confirmed to Gizmodo that they have either recently eliminated forced arbitration for both harassment and discrimination claims or that they have never had these types of agreements. Several didn’t respond, and a few responded that they only eliminated claims of sexual harassment, but not discrimination. When asked why it hasn’t eliminated forced arbitration for discrimination claims, a Google spokesperson said the company uses arbitration “for most employment matters in the US” because the company believes it’s the “most effective for all parties involved— it’s generally faster than proceeding in court and protects the identity of the person who brought the complaint.” The spokesperson added that Google’s arbitration agreements don’t prohibit an employee from publicly disclosing their claims. Apple, SpaceX, Uber, and Airbnb didn’t respond for comment, and Tesla declined to comment. Uber did not specify whether the changes to its arbitration policy would include discrimination claims or class-action lawsuits. Airbnb told BuzzFeed this month that it was eliminating forced arbitration for both sexual harassment and discrimination claims, and Apple told the publication that “earlier this year” it gave employees the option to opt out of arbitration. Reddit, Verizon, and Amazon all said they don’t have forced arbitration for any type of claim. This is not true for all of Amazon’s workforce, namely its independent contractors, who are not classified as employees. An Amazon spokesperson confirmed to Gizmodo in May that some contractors do have arbitration clauses in their contracts. A Microsoft spokesperson told Gizmodo its elimination of forced arbitration for the limited number of employees it applied to includes both discrimination and harassment claims—a detail it failed to mention when it announced the change nearly a year ago. Twitter claims it has never had forced arbitration agreements for employees. However, a class-action lawsuit former Twitter employee Tina Huang filed against the company in March 2015 stated that “virtually all employees hired in the last 18 months have agreed to arbitration and class action waiver.” While these might not have been forced, the allegation poses some questions around whether companies pressure or trick employees to sign away their right to a trial by jury. Jason Lohr, an attorney for Huang, told Gizmodo that he believes Twitter employees have to sign the arbitration agreement during the on-boarding process, but that they can opt-out of it within 30 days. While Facebook and eBay announced earlier this month that they were eliminating forced arbitration for sexual harassment claims, like Google, neither offered an explanation for why they weren’t also eliminating the requirement for discrimination claims. Lyft also told Gizmodo in an email that it was only waiving forced arbitration for individual claims of sexual assault or harassment. The company also stated that it has let employees opt-out of mandatory arbitration for all claims “for over two years.” It did not comment on why the company includes forced arbitration in contracts if it gives employees the option to opt out. Subit said that by only waiving selective types of claims, companies are conveying that they “are not doing it for the reasons they are saying, they’re simply doing it because they’re afraid of the backlash.” And aside from communicating that certain types of harassment or discrimination are more devastating than others, it’s inefficient, namely for women of color. If someone has multiple claims—sexual harassment and racial discrimination, for instance—that person would have to bring two cases: one in arbitration and one in litigation. “From a perspective of efficiency, this is no way to run a railroad,” Subit said. In addition to complicating the system for dealing with these sensitive issues, companies are sending a clear message to their workforce and to the public: When it comes to eradicating systemic issues, some take priority over others. More often, nothing happens at all unless the company wants to make it look like it cares. Do you have information about the tech industry’s handling of misconduct allegations and workplace concerns? You can email me at melanie.ehrenkranz@gizmodo.com. You can also contact us anonymously using SecureDrop.